I wanted to give you an update on the 1st annual, MiniMatisse Artist Trading Card Swap. As you can see, I have been working a lot on my #ProcessPigs project... Don't worry, I haven't lost my mind, in the next couple of weeks this will all unfold for everyone. You will have a good idea of what I'm doing with that project. 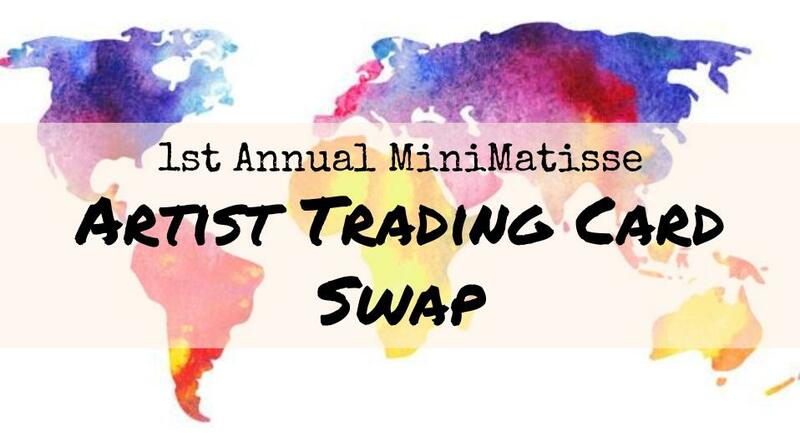 In the meanwhile, I wanted to let everyone know the ATC's swap has been GROWING!!! So as of right now our Swap has 47 schools participating. We are estimating about 3000 cards to be traded as of right now. Most of the cards are coming into the trade from within the United States, but there are schools from Belgium, Puerto Rico and Canada. These cards are from all ages, and all school settings. I'm excited to have both homeroom and art classrooms involved. This is going to be BIG!! 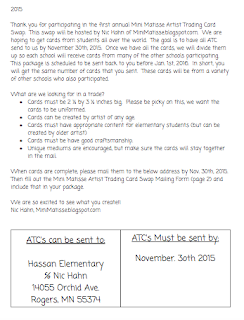 Next make quality ATC's with your class or program. Finally!! We send back the same size trade that you sent us. 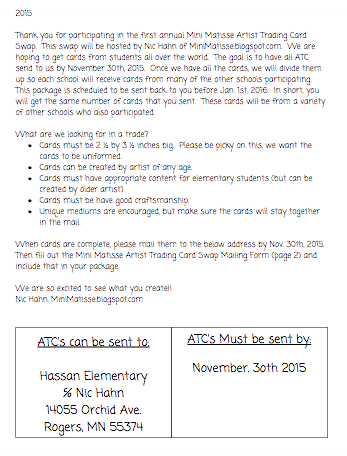 This will have cards from many other schools that participated in this Mass Swap. The goal is that you will get back your cards by Jan. 1st, 2016 (but most likely before). All are invited to participate, all ages, all schools, all classes (you don't have to be an art class), home-schools, community programs... 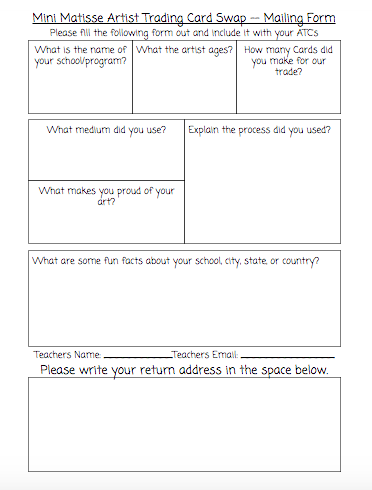 I have been working HARD at trying to set up for my 4th grade to participate. They will be making ATC's this whole year. 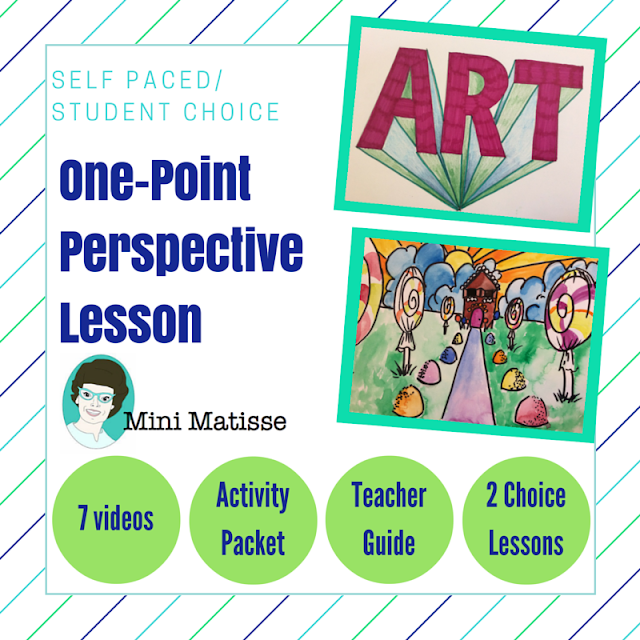 I have created some examples of ATC's and some flipped lessons, and I'm sharing them all with you. Please feel free to take a look and use all the ATC information on this blog (click here) or on my website (click here). Come join us!! We are excited to trade! I have some other really exciting things to present to you in the upcoming weeks about this great opportunity, so stay tuned! Entered. Looking forward to this opportunity for the kids! Thank you so much for hosting. GREAT! We are over 65 trades since this post... :) Glad to have you join. 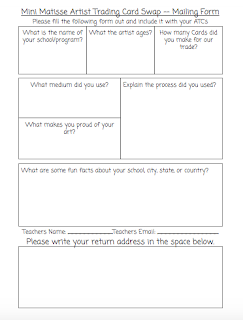 Mrs. Hahn, I am a Canadian Mom of a wee artist who's not got an art teacher in school involved in ATC's but I am seriously interested in finding a swap for her/us to take part in!?!? Is there someway we could get involved without being part of a schools art classroom?? I have been searching without find, for a swap in Canada for kids, for at least one year ;( Please let me know if there's a way we could get involved!!! Thank You! !